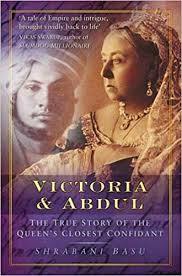 November’s book discussion will be over Victoria and Abdul: The True Story of the Queen’s Closest Confidant by Shrabani Basu. This is the book on which the recent movie was based, and it tells the story of the friendship that developed between Queen Victoria and an Indian servant during the later years of her reign. Their relationship was a cause of controversy in the queen’s family and among others on the palace staff.